I roasted some brussels sprouts and onion for dinner the other night. I really had to roast all my brussels sprouts because I had forgotten I had them and they were too close to turning. Cooking them would stop the process and give them a reset. So I roasted all of them with some onions, making far more than could be eaten in one meal. I stored in them in container in the fridge and made a salad the next day. It was still a pretty big salad, making three servings in all. 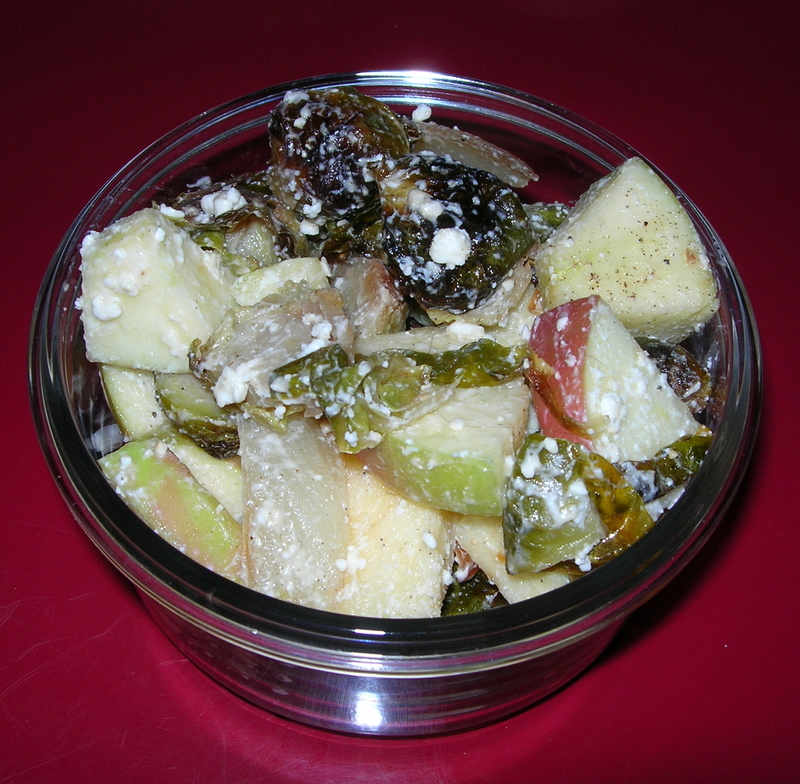 I had about 2 cups of roasted brussels sprouts and bits of roasted onion. I cut the brussels sprouts in half or quarters depending on how big they were. Then I cut up an apple. I used a Gala, but any reasonably crisp and tart apple will do. I added about 1/4 cup of feta cheese and some salt and pepper. Then I added about 1/2 TBSP of white wine vinegar. I presumed that the olive oil used in roasting the brussels sprouts would be more than enough oil to balance the vinegar and i was right. The salad was delicious. There’s a smokey sweetness to the roasted sprouts and onion and the apple adds its own tart sweetness. The feta adds an earthy tang and sour note that balances the sweetness perfectly, especially when brightened up by a bit of white wine vinegar. I made the vinaigrette while chopping the ingredients for the salad. In a small sauce pan, I added 2 tbsp of olive oil and 1/2 of a medium yellow onion, diced. I let the onions sauté until they were tender. 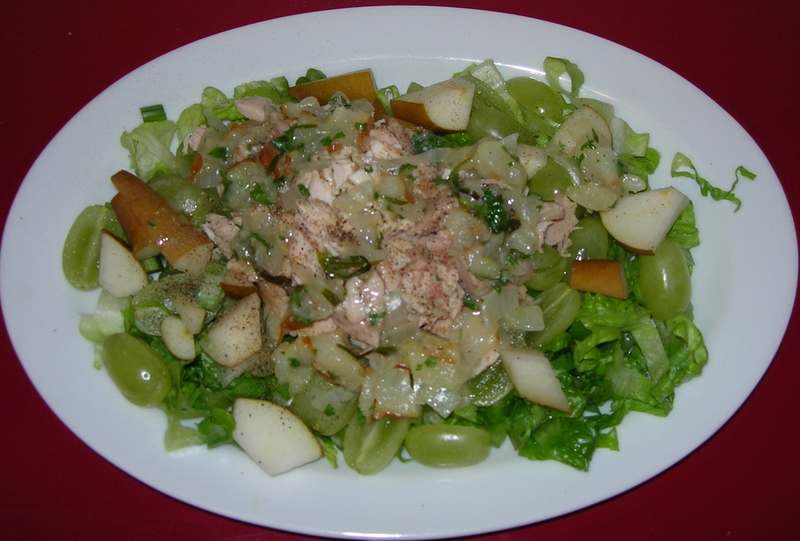 Meanwhile, I cleaned and chopped 4 leaves of romaine lettuce, 1 small stalk of celery, a handful of green grapes (1/2 or so) and about 1/2 cup of cooked chicken (removed from a roast I made earlier in the week). I also chopped up a Bosc pear. It had ripened unevenly, so only a portion was ripe and the rest was not. This happened to inspire the dish. I had planned to just chop the pear up on the salad and add some oil and balsamic vinegar. But now I needed to do something with the stubbornly unripened part of the pear. I put the ripe chunks of pear on the salad. The rest I reserved for the salad dressing. I added a bit of pepper and finished up the vinaigrette. So now my onions are nice and soft. I added the stripped off leaves from two tarragon stems. Then I added the chopped up pieces of pear. I let them sauté for a bit before adding the fresh-squeezed juice from 1 lemon and a bit of salt. I continued to let them simmer until tender and then mashed the pears up with my fork. I thought about pureeing the mix, but was too hungry to get my Magic Bullet out and puree. So, i just mashed a bit with a fork and added 2 TBSP of white wine vinegar – I went by taste more than volume, adding until it was light and fresh. Then, just for a bit of color and earthiness, i added about 1 tsp of finely chopped fresh parsley. This is a subtly flavored vinaigrette. The pear adds a mellow sweetness, the onion a bit of heat, the lemon brightens it up and the tarragon is just heaven brought down to earth and infuse in a plant. The white wine vinegar just marries all those flavors into a wonderfully light vinaigrette. This made enough for 4 large salads, so i dressed the salad I made and stored the remaining vinaigrette for some more lovely salads. Heat 1.5 TBSP of olive oil in your soup kettle, while heating the oil, chop 1 medium yellow onion and add to the oil. Add dried oregano and thyme and some salt and pepper. Sauté until tender. Add a can of diced tomatoes and heat, stirring together. Add 1 cup of lentils and 5 cups of water. Bring to a boil, put a lid on it and let it simmer for 20 minutes. Meanwhile, clean and chop red chard, separating the leaves from the stems. When the lentils are tender, add the stalks, then five minutes later add the green leaves. Let cook for about 5 more minutes and remove from heat, adding a bit of salt and pepper and the juice of one fresh lemon. The flavor is hearty, bright and rich. 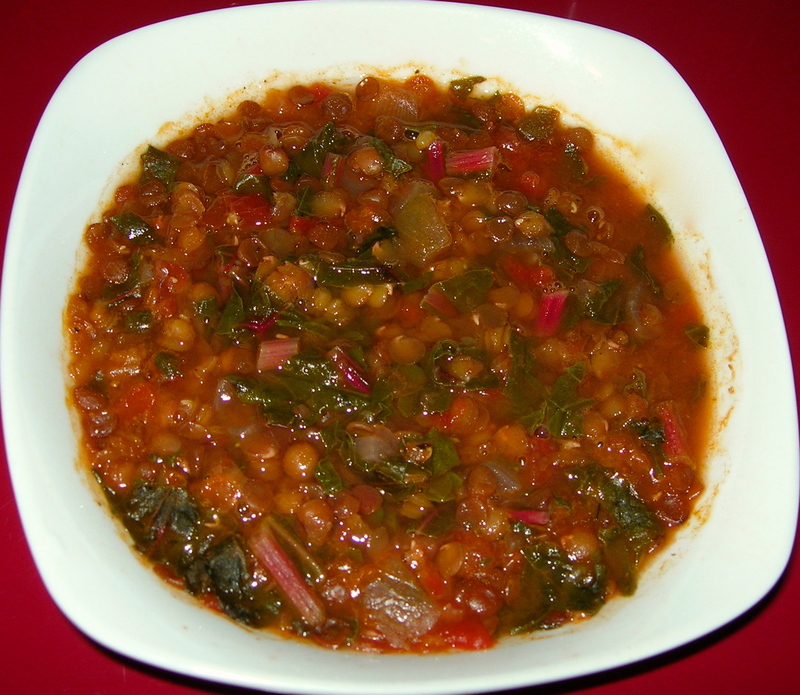 The lemon really brightens the flavors and helps marry the chard and lentils.